Born December 5, 1954 in South Western Siberia, Russia, Ekaterina Mikhailovna Mozhaeva dreamed as a child of becoming a ballet dancer. Unfortunately, a long childhood illness thwarted her aspirations—since ballet, if one wants to succeed in Russia, is a discipline for which training starts at an early age. Still, she wanted to perform, and when she recovered, friends suggested that she try the circus. So, Ekaterina went on to train at the Circus’s Studio at Kemerovo, a Siberian city in the region of Novosibirsk. There, she learned a variety of circus disciplines, and partnered with another student, Anatoly Evgenevich Lotishev (b. March 10, 1949), to create an acrobatic clown duet under the name of Anton & Antoshka (spelled "Antoschka" in German). They began performing together in 1973 in Novosibirsk. They soon became very successful; Ekaterina’s character, Antoschka, which comes out as a whimsical, mischievous, marionette-like tomboy, was immediately very popular with their audiences. Then, Anton & Antoshka appeared with the Leningrad Stage Circus, and in 1976, they were contracted by SoyuzGosTsirk, the central Soviet Circus organization; from then on, they were featured in all the major circuses of the Soviet Union, and on tour with the prestigious Moscow Circus companies. Ekaterina added dogs and cats to her act, with which she worked in a playful, engaging way that fit her character perfectly well. Then, things began to change with the advent of Perestroika, and the fall of the USSR. It was a different atmosphere altogether, and Anatoly (Anton) decided to leave Ekaterina, and to continue his own clown career with his wife, Tatiana. But with Antoschka, Ekaterina had a strong, likeable character on which to build a new career of her own. In 1989, she went on an extensive tour abroad with the Moscow Circus On Ice, in a show built around Antoschka, and titled A Clown’s Dream. The following year, after a tour of Germany, Antoschka decided to leave Russia and to settle there, in the town of Korschenbroich, near Dusseldorf. She began working with German and Austrian circuses, and in 1993, she starred in the ice revue Holiday On Ice, in a reprise(French) Short piece performed by clowns between acts during prop changes or equipment rigging. (See also: Carpet Clown) of A Clown’s Dream built again around Antoschka’s character. She toured with Holiday On Ice until 1995, visiting The Netherlands, Italy, Germany, Poland, Venezuela, Colombia, Chile, Argentina, Thailand, Malaysia, and Singapore. After two years with Circus Busch-Roland, Antoschka went on to work with some of Northern Europe’s most important circuses, including Krone and Benneweis, and participated in European tours of the Germany-based Moscow State Circus (Moskau Staatszirkus). 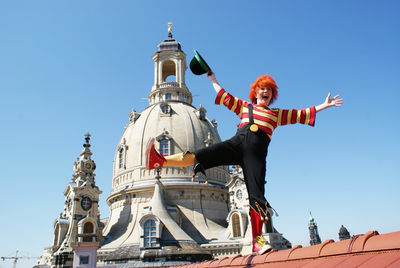 In 2005 she started performing her solo stage show, Ansichten eines Clowns, in Central America, and subsequently performed it regularly in Germany, while giving clown workshops and teaching clowning. 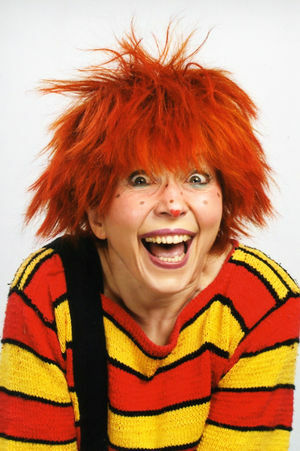 Meanwhile, Ekaterina/Antoschka had been involved in various global social projects, which culminated in her creating an international clown organization involved in social and peace issues, The World Parliament Of Clowns, in 2006. That same year, she created a new solo program, Antoschka und ihre WUNDERfreunde ("Antoshka and her WONDERful Friends"). Diva & Clown, and Solo für einen Clown would follow. Dubbed "Die Königin der Clowns" ("The Queen of Clowns") by the German press, Antoschka has been sharing her time between Antoshka’s Clown-Theatre and her solo shows, further circus tours (including, in 2010, a tour of the Moskau Staatszircus, Planet of Smiles, in which she starred), and her work with the World Clown Parliament, the Jersusalem Peace Academy, and the German Water Foundation.